I personally don’t understand the concept fully. We as a society are positively obsessed with uploading images, status updates, and information to the internet at all times. However, I feel like a park bench is one place where we can go to forget about all of the craziness going on in our live and just take a moment to relax and enjoy the scenery. 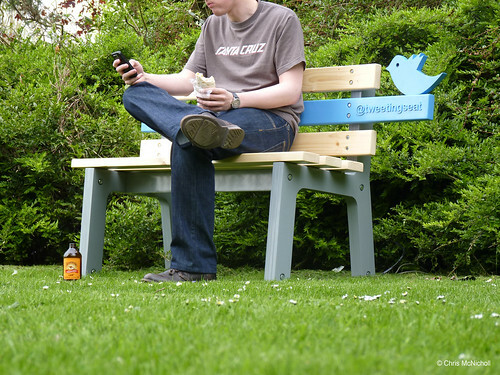 An article from TreeHugger explains that “if a community wants more people to get out and enjoy parks and public spaces, this bench could be used as a tool for promoting interest.” I agree with their statements, and I do love the environment and social media. Perhaps this is just the first step to use social media and the internet to show people how important the state of our environment is. To see more photos, visit the TweetingSeat on Flickr. INFOGRAPHIC: Do College Professors Use Facebook?